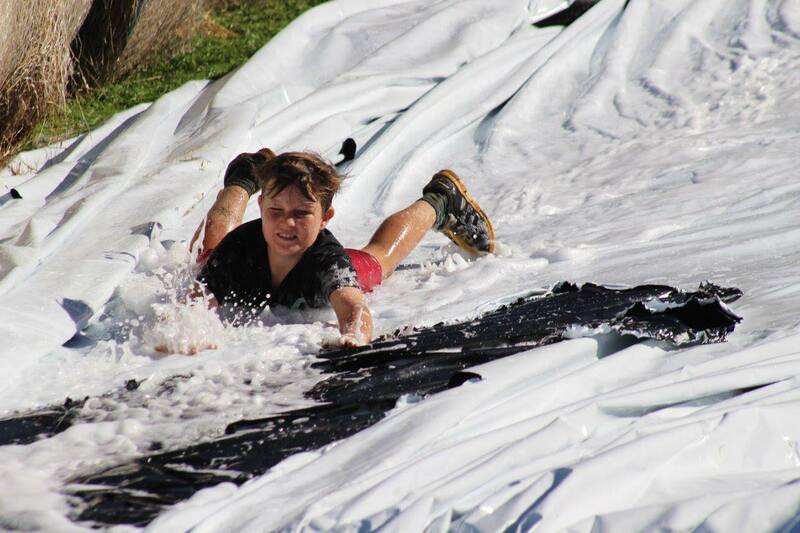 A big thank you to the Home and School for organising the AMAZING Whitestone Wipeout. 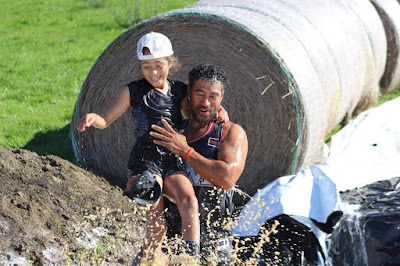 Not only have you come up with a fantastic fund-raiser but it was a true community event, a Kiwi experience, and many people said it was the best event they had been to in a long time. St Joseph's Home and School I think you have started an historic Oamaru event. In particular, thank you to Rebecca Heffernan and Rebecca Meek for incredible vision and organisation and the big team of Home and School parents who did so much to make it happen. We're proud of you and what you've achieved. Our open place enrolments are full until 2022 and I sadly have to turn people away. But we can take Catholic-affiliated families. That means children who are Baptised, or preparing for Baptism or have siblings or parents who are Baptised or preparing. Jesus told his disciples to go out into the world and preach the Good News to the whole of creation. Our Church spreads the Good News in many ways and one major way is through our Catholic schools and one way you can do this is to have a think about what you can do to bring Christ into the life of a child. If you are a practising Catholic it is possible that you can support a child who is close to you to enter St Joseph's school. Please have a chat with me if you think this may be the case. NZEI, the teacher's union is soon to begin a national campaign. I would like to ask you to consider supporting this campaign. The main things we are concerned about are: the shortage of quality teachers; how many teachers and principals are not staying in the profession due to stress and overload - that's not a whinge, it means we're losing our combined expertise; large class sizes; and the lack of services and support for children with learning and/or behavioural needs. There is a pay rise request. But a few years ago teachers were vehemently against suggested pay rises when what is really needed is more help for children and that's where we want the money to go. But now we are addressing teacher shortage and we need to also attract quality people into our profession. All of us in the profession do it for the children and we want what the parents want - a good education for the children, reasonable class sizes, and extra support for the children who need it. I believe widespread positive support for this campaign can only result in better learning conditions for your children, and children's children. On Thursday, April the 26th at 6.00pm Fr Michael Dooley will be ordained the 7th Bishop of our Otago-Southland Diocese in the Dunedin Town Hall. Everyone is very welcome to attend and we encourage families from our school to be there. Could children please wear their school uniform. While the Mass will be a little longer than usual the Town Hall has plenty of space if younger children are getting restless. It will be wonderful to gather with families and parishioners from all over our Diocese. Our parish is putting on a bus to go to this event at $10 per person. I will be attending with our four head students. If anyone else would like to come on the bus please let the office know. Praying as a family...have you heard of the saying, “A family that prays together stays together.” This saying is attributed to Venerable Father Patrick Peyton. He is also fondly known as the “Rosary Priest”. He was the founder of the Family Rosary Crusade. Pope Francis furthered his journey to sainthood by naming him as Venerable on 18 December 2017. During the holidays, when daily life is a little less frantic, you might take time to pray a decade of the rosary as a family. We celebrate the feast of the Annunciation on April 9. This day celebrates the appearance of the Angel Gabriel to the Virgin Mary to announce of the birth of Christ. 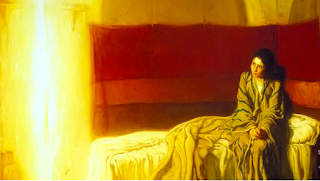 Mary does not understand the announcement but has faith and accepts God’s trust in her and the difficult journey ahead. How often do we need to have faith and trust even though we may not completely understand? The Church recognises Mary’s courage in this feast. Blessings to you and your families and wishing you all a safe holiday. Andrew Sinclair, Daniel & Matthew Woodhouse, Indya Cunningham, Molly-May Mestrom, Zara & Hana Davies, Lewis Gough, Sandrene Mordeno, Tiffany Chen, Yi Qun Zhong, Molly McGeown, Evan Adams, Millie Fogarty, Cooper van Roy and Luke Laming. Last Friday we raised $227.00 from a mufti day for Caritas. Tonight the Yr 8 children along with Mrs Jones-Hogan and Mrs Winders will be sleeping on cupboard in the hall and tomorrow morning they will be going on a walk before they have breakfast so the children get to experience what it would be like for people who have no beds or convenient food due to poverty or natural destruction. North Otago Cricket will be running their very popular cricket holiday programme on Tuesday 24th and Wednesday 25th April at St Kevin's College gym. Young Beginners/Soft ball players (aimed at kids who play with soft ball and early beginners) from 9.15 am to 10.45 am. Experienced players/hard ball players from 11.00 am to 12.30 pm. Please bring a drink, snacks, own equipment but not essential and sport friendly clothing and $10.00 for either day. To register, please email nocacoaching@gmail.com with your child/children's name, age and email address. All school library books are due back tomorrow. Hana Davies has lost her named school jersey. Please have a look for it in your child's bag. Winter uniform to be worn next term with ties for everyone. 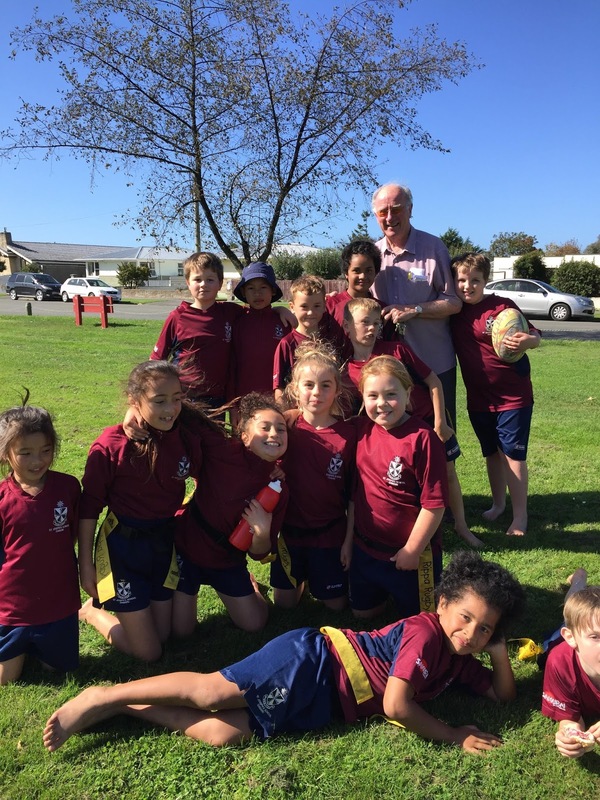 Please click the link to view photos from last week's Rippa Rugby tournament. Please drop this form back to the office if you have any changes to addresses, phone numbers, medical conditions, emergency contacts etc. We still require small pinafores, winter boys school shorts and shirts for our uniform shop. In the holiday's have a clean out and if you have any spare clothes, Adele would love to have them. A booklet will be sent home with each family tomorrow about their sport codes, practice days, uniforms etc. Please look for it in your child's bag. All sport fees have to be paid or a payment plan in place before Saturday 14th May as some parents have opted to wait until sport teams were named before making payments. Sport uniforms will be handed out once fees are paid. If you have any difficulty with the fees this year, please contact the principal. The uniforms and gear bags for coaches will be handed out in the first week of term 2. All coaches have been given the contact details of their teams and will be in touch with their teams directly. Fees - some sport associations have increased their fees in which we have had to increase our fees in some codes. Score benching - a roster system will be set up for all parents in each team to do score bench duties. This will come out in week 1 of term 2. You will be required to do at least 1-2 duties each. Refereeing - the Raptors boys basketball team requires a parent to referee for them. Rep trials will be held on Saturday 14th April at the Showgrounds for the 11th Grade and 13th Grade. 11th Grade starts at 10.00 to 11.30 am and 13th Grade starts at 12.00 - 1.30 pm. Anyone who was not able to attend last weeks trials are more than happy to attend this weeks trials. There is a skills sessions being held on Friday nights from 4.30 to 5.15 at the Showgrounds starting Friday 4th May. We need a parent to oversee this group of 4 children, otherwise a roster system will be set up for the parents. Small Blacks Coaching Course for ALL RUGBY COACHES being held on Saturday 14th April at Excelsior Clubrooms from 10.00 am and on Wednesday 2nd May at 6.00 pm. This is a must attend for all our rugby coaches. All names to Paula Brien so she can forward them on to North Otago Rugby. Mouthguards are compulsory for all rugby players so please ensure your children have them. The policy is no mouthguards, no play. 6 Year Old Team - we still have no-one offering to coach/manage this team. If I don't hear back before the start of term, I will unfortunately have to withdraw this team. The annual Pompallier Trophy will be held on Sunday 6th May in Timaru. 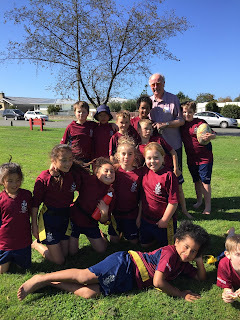 (This is the first Sunday back of term 2) This is a 10 a-side tournament played against Catholic Clubs from Christchurch, Ashburton, Timaru and Oamaru and involves rugby games, sprint races and a tug of war competition. The teams competing are St Joseph's, Marist Albion, Timaru Celtic and Ashburton Celtic. The grades are Under 9, Under 11 and Under 13. The competition will be at the Celtic Grounds in Timaru and starts with a managers/coaches meeting at 10.00 am. Can all players confirm with your coach if you are available to attend on this day ASAP because if we are short of players, we will have to recruit some other players. The kids play 3 games each. School Holiday Entertainment - MTO Children's Theatre presents 'The Pied Piper' a one hour musical play at the Opera House Ink Box Theatre on Thursday 26 to Saturday 28th April. Tickets on sale for $10.00 at the Opera House. Skate Park Competition - there is going to be a skate park competition for our local youth at the Oamaru Skate Park on Saturday 28th April from 11.00 am to 3.00 pm. Entries taken on the day. Arrive early so you have time to enter. Competitions will be split into age group categories and there will be lots of prizes, including MGP scooters. Also present will be two professional MGP Team Riders who will be doing some displays. There will be more information put on the following social media site during the school holidays. Oamaru Bluelight Facebook page, Youth Council Facebook page and Oamaru Today Facebook pages. All confirmed team lists are up on the Sports Notice board. Names have been submitted to North Otago Hockey and still awaiting to hear back from them. Claire Cameron happy to coach this team on Sundays with her team. Skills Start: Saturday 5th May at 10.00 am. Practices: days to be confirmed at the first practice. Practices: Tuesdays and Thursdays from 3.30 to 5.00 at SKC.